Alexa Fluor® fluorescent dyes are widely recognized as superior fluorescent dyes available for conjugation. They are highly water soluble and remain fluorescent from pH 4 to pH 10. The detection level of any fluorophore-antibody conjugate depends on brightness and photostability of the dye; antibody activity, specificity, and cross-reactivity; and the optimal moles of dye per mole of antibody. These parameters have been researched for each dye conjugate to optimize the level of antibody detection and minimize background. Whole IgG antibodies are isolated as intact molecules from antisera by affinity chromatography. They have an Fc portion and two antigen binding Fab portions joined together by disulfide bonds (Figure 1), and therefore are divalent. The average molecular weight is reported to be about 160 kD. The whole IgG form of antibodies is suitable for the majority of immunodetection procedures and is the most cost effective. F(ab')2 fragments of antibodies are generated by pepsin digestion of whole IgG antibodies to remove most of the Fc region while leaving intact some of the hinge region. F(ab')2 fragments have two antigen-binding Fab portions linked together by disulfide bonds, and therefore are divalent (Figure 1). The average molecular weight is about 110 kDa. They are used for specific applications, such as to avoid binding of antibodies to live cells with Fc receptors or to Protein A or Protein G.
FabuLight antibodies are Fab fragment secondary antibodies specific to the Fc region of IgG or IgM primary antibodies. They are available conjugated with 9 different fluorophores and biotin, and enable labeling of primary antibodies prior to incubation with cells or tissue. This provides a time saving alternative to sequential incubation flow cytometry and immunohistochemistry procedures, without compromising the active site of the primary antibody. Figure 1. Excitation (left) and emission (right) spectra of Alexa Fluor®-conjugated affinity-purified secondary antibodies, streptavidin, and purified proteins. The dyes are Alexa Fluor® 488 (blue), Alexa Fluor® 594 (green), Alexa Fluor® 647 (red), Alexa Fluor® 680 (pink), and Alexa Fluor® 790 (black). This figure illustrates the relative shape and position of each fluorophore conjugate in the peak region of its excitation and fluorescence emission. Quantitative comparisons should not be made since peak heights have been normalized. All spectra were obtained with an M-Series spectrophotometer system from Photon Technology International, Inc.
Table 1. Approximate peak wavelengths of excitation and emission for Alexa Fluor®-conjugated, affinity-purified secondary antibodies offered by Jackson ImmunoResearch in order by increasing peak of emission. Approximate values are given for purposes of comparing one fluorophore with another. Actual values may vary depending on the spectrofluorometer used in each laboratory. Alexa Fluor® fluorescent dyes are a trademark of Life Technologies Corp. They are provided under an agreement between Life Technologies Corp and Jackson ImmunoResearch Laboratories, Inc and the manufacture, use, sale, or import of these dyes is sold pursuant to a license from Life Technologies Corp for use of its fluorescent dye technology. The sale of these dyes or products containing these dyes is expressly conditioned on the buyer not using them (1) in manufacturing; (2) to provide a service, information, or data to an unaffiliated third party for payment; (3) for therapeutic, diagnostic, or prophylactic purposes; (4) to resell, sell, or otherwise transfer this product or its components to any third party, or for any other commercial purpose. For information on purchasing a license to this product for purposes other than research, contact Life Technologies Corp, 5791 Van Allen Way, Carlsbad, CA 92008 or outlicensing@lifetech.com. Possible uses of FabuLights also include labeling cell surface immunoglobulins without cross-linking and activating B cells, and labeling Fc chimeras (fusion proteins). FabuLight antibodies are Fab fragment secondary antibodies specific to the Fc region of IgG or IgM primary antibodies. They are available conjugated with 9 different fluorophores and biotin, and enable labeling of primary antibodies prior to incubation with cells or tissue. They provide a time saving alternative to sequential incubation flow cytometry and immunohistochemistry procedures, without compromising the active site of the primary antibody. Western blot using Alexa Fluor® 680 far-red dye and Alexa Fluor® 790 infrared dye. Alexa Fluor® 790-goat anti-mouse IgG, Fcγ Subclass 1 specific (min X Hu, Bov, Rb Sr Prot, 115-655-205)(green) shows heavy chains and Alexa Fluor® 680-goat anti-mouse IgG, light chain specific (min X Bov, Gt, Hrs, Hu, Rb, Rat, Shp Ig, 115-625-174)(red) shows light chains. Imaged using LiCor Odyssey imager. Antibodies conjugated with far-red- and Infrared-emitting dyes are more sensitive than those with dyes emitting visible light due to low fluorescence quenching of the conjugates, high extinction coefficients of the dyes, and low background autofluorescence. 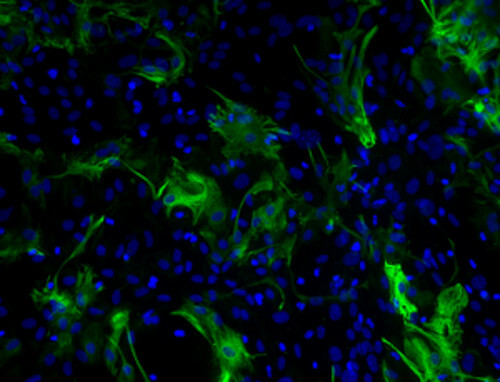 The increased brightness allows for a wider range of immunofluorescence detection and imaging modalities. Far-red and Infrared dye conjugates can be used for higher sensitivity Western blots, quantitative Western blots, in-gel Western blots, microWestern arrays, in-cell Western arrays, on-cell Western arrays, tissue section imaging, small animal whole body imaging, and other techniques that require the brightest dyes.